I could have sworn I wrote about Dog Day at the Pool, but I guess I didn't yet. It was so fun! As I said, the local wave pool closes for the season, and before they do, they have a "Dog Day". It's $5 to bring your dog to play in the pool for a few hours. We took Joey last year, and he loved it. I was excited to take him again. Once again, he had a blast! He was never sure what to do, but he was so excited to be there. He kept running all over the place in the pool, grabbing toys and then promptly dropping them. Every time someone would throw a toy for their own dog, Joey saw it and ran after it, too. I wish he'd try out the deeper water, because I'm curious if he can swim, but he likes to stay where he can touch. (The owner of Lucky Puppy, his doggy daycare, said that he prefers the shallow end of the pool there as well). It seems that with 70-ish dogs there, you'd see some fights break out. Can you imagine me from two years ago, when I was scared of dogs? There is no way I'd go into a fenced in area with that many dogs! The Dog Day is actually more like "controlled chaos", though. The dogs got along well, and there was a vet there looking for any signs of aggression (aggressive dogs would be asked to leave). It was just a good ol' day at the pool! The weather has taken a GREAT turn toward fall, and I love it. Yesterday, after dropping the kids off at school, I went right from there to the state park, where I ran the 5K loop. The dew point was 52 degrees, which is SO much nicer than the 70-something dew point temps we've had lately! I am excited for the leaves to start changing color. Last night, before cross country practice, Renee and I were talking about running and how we'd like to start thinking about incorporating more than just running into our routines. I told her that I had just been thinking about that a lot lately, and I've cut back on my mileage quite a bit. I've been looking for other opportunities to stay active. I think cutting back a bit for now will help me to get excited to train for the Indy Mini (I don't have to officially start training for that until February). Swimming has never been of interest to me, but lately I've been thinking about it more and more. I'd like to learn the proper way to swim, so I may look into classes or lessons this winter. Today, I had plans to meet Andrea at the rec center to swim (well, Aqua Jog, if I'm being specific). I have an extra Aqua Jogger (Jerry's) that I brought with me for her to try out. I had about an hour to kill before meeting her, so I decided to just go to the rec early and run a couple of miles on the indoor track. When I got there, I realized I had forgotten my foot pod at home. The foot pod is synced with my Garmin to give me the distance when GPS isn't available, like on the indoor track. I decided to just turn off the GPS and see if the Garmin even came relatively close to an accurate distance without using a food pod (using just the accelerometer in the heart rate strap). Interestingly, after several laps, it was reading the same as my foot pod would have shown! I was really surprised. I had read on the Garmin site that the watch was supposed to be "smart" enough to figure it out after a while, but when I tried that on a treadmill, it wasn't even close to accurate. On the indoor track, though, it was actually very accurate! I guess there is no need for my foot pod there anymore. After a couple of miles, I went down to the locker room to change for the pool, and then I "swam" a few laps while I waited for Andrea (I put that in quotes because I'm sure a swimmer would not call what I was doing swimming, haha). When she got there, we went in the deep end and I showed her how to use the Aqua Jogger. Then we just chatted for about an hour while we exercised, which was awesome. The time went by really quickly, and getting in the pool after running felt amazing. Andrea loved the Aqua Jogger, so we're going to make this a regular thing. The timing worked out really well, too--I have enough time to get in a short run before going in the pool, and then I'm still home by 10 to get everything else done before the kids get home. Today, I had plans to go out for lunch with my mom. She had a La Pita gift card, and you never really have to twist my arm to go to La Pita ;) I'm trying to be more conscious of calories now, so I ordered the shrimp appetizer. I'd gotten it once before when I went to La Pita with Eli, and I really liked it. It's butterflied grilled shrimp and vegetables with a really good marinade. I ordered a side of garlic sauce (my favorite!) for dipping. The garlic sauce had more calories than the food, but it was totally worth it! (The garlic sauce is like an aioli--basically just oil and garlic, only thickened with potato instead of egg). The garlic sauce is that white stuff in the top right; 400 calories for that tiny cup! 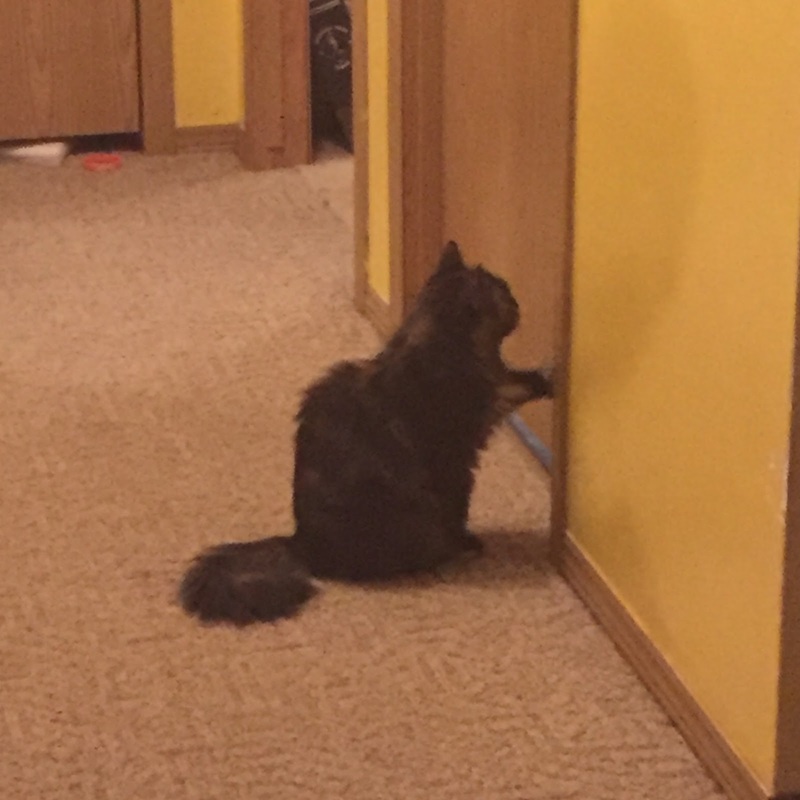 Finally, this is a bad photo, but I just had to share this pic of Monica politely knocking on the bathroom door while Noah was in there. She is hilarious! The more we get to know her, the funnier she is. Such a funny photo of Monica! It's so neat they have that day at the pool for dogs. I have found that doing other things and cutting my mileage down has renewed my interest in running (the lower temps are also helping) I am a HUUUUUUUUUUUUUGE fan of yoga and I have just started kickboxing (WHAT?!?!) it is so hard but it is fun and boy do you work up a sweat!! I am so in love with Monica <3 Could she BE any cuter? Gigi, I am the same as you! I usually do yoga and a little bit of running, but just started kickboxing. I love it! Nice!!! I was so scared when I started but I am getting into it!! Omg that picture of Monica is the CUTEST!! I'm so glad she's fitting in so well with the family! While running is one of my main form of exercises as well, I've gotten into swimming more too. But I also LOVE doing body pump classes at my gym (strength training). It makes me feel so strong and powerful! My personal trainer always told me you have to change up your exercise otherwise you will plateau or in some people, they start gaining weight - your body adjusts to the exercise routine so you need to challenge it to get your HR and metabolism going. If you want something new to try, you should see if your parks and rec department offers cardio tennis - don't be afraid, you don't have to know how to play tennis. The friend I did the class with didn't know how to play tennis but she did totally fine. The class kicked our butts (in a good way). The class was for 8 weeks and I lost 10 lbs in the process. I think I also sweated more doing that 1 hour class than I ever did during my half marathon training. It looks like Joey had a blast. I would love to take my basset hound to a place like that. She'd be so happy. Monica is too funny knocking so politely. My husband keeps trying to convince me we need a cat. Seeing how quirky yours are is starting to convince me. Maybe you are saving it for a post today, but I just say From Fat to Finish Line is now on Netflix Instant!! I just watched From Fat to Finish Line. It was awesome! You are all inspiring! Thank you for sharing so much of your life with all of us. If you can ever get access to a pool where both you and Joey could get in, you could try to "teach" him to swim. We were able to do that with one of our dogs - we just held her belly while she paddled her feet - and once she built up her swimming confidence, we couldn't get her OUT of the pool. Omg! Joey running is the pool is too cute!